During the summer months, if you kneel down and look closely in the patches of soft moss, you may see a very small insectivorous (insect eating plant), round-leaf sundew (Drosera rotundifolia). While this plant makes its own food by photosynthesis, because the habitat is deficient in minerals and nutrients, the plant has evolved the insectivorous adaptation to supply those nutrients. The little sun-like leaf glistens with a sweet-tasting fluid. An insect alighting on the leaf finds itself stuck like glue. It dies and is eventually digested. 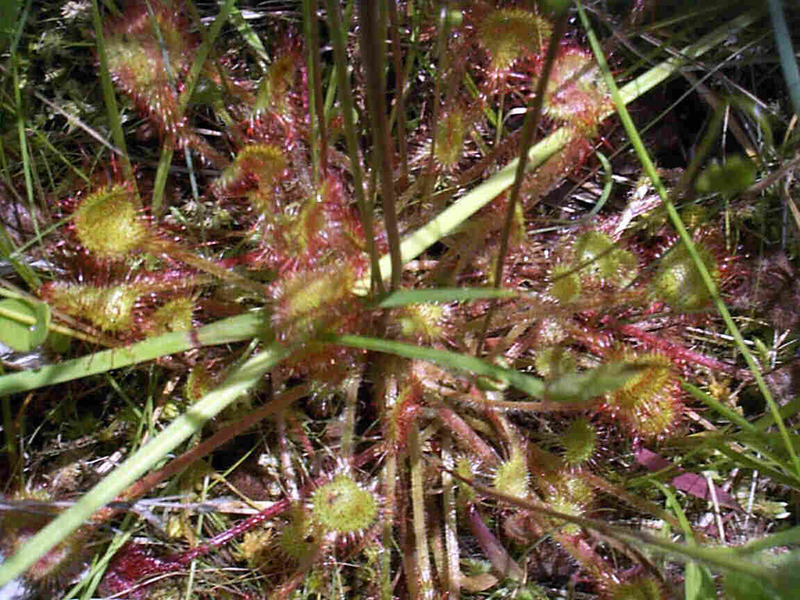 Sundews usually grow in wetlands called bogs, which in New Jersey, are very uncommon. But they are doing well in this wetland. At this site the elevation continues to drop slightly and the area is slightly wetter (hydric).